Many West Milford residences enjoy the comfort and convenience of oil heat in their homes, but few people think about the possible problems of storing a lot of heating fuel on their property. 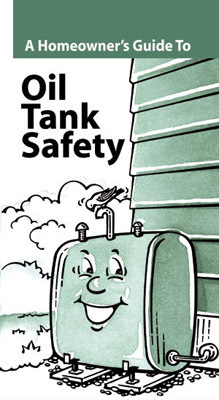 This brochure explains how to lessen the environmental risk above-ground heating oil tanks can pose. 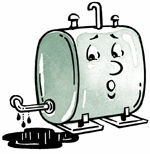 An old oil tank can start to leak slowly from the bottom of the tank. This can be contained while a new tank is installed. 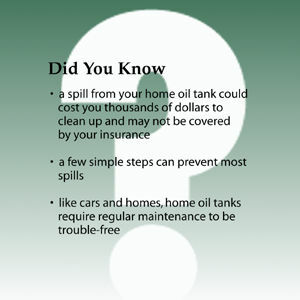 If the leak is not fixed or expands it may spill hundreds of gallons of heating oil into your home and the environment. The same is true of oil tanks that are not installed properly or have not been cared for. Nearly half of all oil spills reported to the New Jersey Dept. of Environmental Protection each year are from domestic oil tanks. Spilled oil can quickly contaminate soil and groundwater. The smell is bad and hard to clear out. You, the homeowner, are responsible for reporting and cleaning up an oil spill. Once an accident occurs, you must act immediately to stop the spread of oil and start a clean-up. A simple clean-up can mean replacing the leaking tank and supply lines and removing contaminated soil to treatment facilities. A complex project may mean replacing the house foundation and treating groundwater. Costs can range from several hundred dollars to several hundred thousand dollars and have been increasing. Most tanks used for heating oil are steel containers that hold about 275 to 330 Gallons and weigh about 2000 Lbs. (1 ton) when full. Their odd shape, which lets them easily pass through standard doorways, also makes them fairly unstable unless they have proper, secure supports to keep them from tipping over. The outside of these tanks is covered with a coat of primer paint to protect against rusting while they go from the manufacturer to distributor and on to the consumer. Don’t buy just any tank. Look for a label on the tank that tells where and when it was made. It should clearly show that it meets a national construction standard. Be sure to check that all piping and connections are metal, not plastic or rubber. This is a requirement of the Mechanical Code and will help protect your family and home in a fire. Don’t try to save money by buying a used oil tank. Besides rusting through quicker, rust and sludge that has collected in the tank will cause burner problems. The few dollars saved won’t cover the costs of an oil spill clean-up if the tank fails. Don’t wait until an incident happens to find out what your insurance policy covers. Many home oil tanks have been designed and built for indoor use. Generally they will last longer and improve the efficiency of oil-fired appliances, like your furnace or hot water heater. Indoor storage tanks should not smell bad, and they lessen the chance of a spill. Place the tank where it can be easily inspected but is unlikely to be damaged by normal household activities. Never let the tank touch a wall because this may cause rust. The Fill and Vent piping must terminate outside the house, at least 2 feet from any window, door or opening into the home. The tank must have a gauge to indicate the level of oil in the tank. If this gauge is not visible from the place where the delivery driver fills the tank (most indoor installations) a vent alarm or whistler must be installed to warn the driver when the tank is almost full to avoid accidental over filling. If you can, have the tank surrounded by a low curb and dyke to contain any leaked oil. This will let you find and contain most spills before they become a problem. Protect the supply line and filter from damage by running them along a wall if possible or by placing a suitable cover over them. Don’t store anything on the tank. It could damage your tank and keep you from noticing leaks. Completely cover the outside of the tank with an enamel paint that prevents rust. Support the tank to prevent it from shifting, settling, or falling over. Prepare a non-flammable base by removing sod and pouring concrete or placing concrete patio stones. If you use patio stones, place them over a level bed of crushed stone or sand to spread the weight of the tank. Wood (including creosote timbers) is not recommended because it can burn, tends to rot, and holds water, which causes metal legs to rust. Make sure the tank is level by adjusting legs. Slope the tank slightly towards the drain to let water drain. Ensure the tank stays upright and does not lean on the wall. If it touches, the tank could rust at that spot. The oil burner supply line should have a horizontal loop before it goes into the building to allow for the ground to rise and fall with frost. The line must be sloped toward the building to prevent water from collecting there. If possible, put the oil filter inside your home because water that collects in it can freeze and split the filter. To protect against breaking the burner supply line and draining the tank, the supply line can be installed through the top of the tank rather than the bottom. Many oil burners have suction pumps which can easily use this design. Your burner service company can tell you if this option is suitable for your tank. Remove leaves, ice, or snow from on or under the tank. If frost heaving or ground settling causes your tank to move, have it leveled promptly. Spills can be avoided if you notice problems early enough. Most fuel oil companies will inspect the tank each year if you ask them to, and they will report to you anything that could cause a problem or recommend repairs. 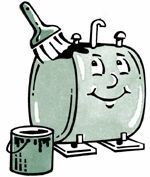 Change your fuel filter and remove any sludge and water from the tank every year. Check with your fuel company about oil additives to reduce the water in your tank. From time to time, check the outside of your tank for any rust. Clean off any spots and apply a rust-proof paint. When replacing your tank, be careful not to transfer all of the contents of the old tank into the new one. Accumulated water, sludge and bacteria will cause your new tank to quickly corrode and leak. These new tanks may fail within one or two years. Keep the tank relatively full over the summer so that less water from condensation will collect inside. Check your tank for problems after each fuel delivery.